Take it with you as you travel. It's safe to take aboard planes and to use anywhere! Meets all TSA's requirements for air travel. 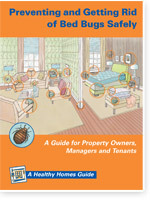 Keep in your home to help prevent potential infestations. Don't let your home be overrun by these obnoxious pests! For commercial use in apartments, hotels, and more. Rest Easy is a TRUE GREEN product, 100% based on all-natural ingredients, such as LemonGrass Oil and Cinnamon Oil. Rest Easy is safe to use around children and pets unlike pesticides containing pyrethrins/pyrethroids, which have neurotoxins that can cause permanent nerve damage and are probable endocrine disruptors, which raise the risk of birth defects, hormonal imbalances, and even leukemia. Rest Easy represents that this product is a Minimum Risk pest control product, and qualifies for exemption from EPA registration under Federal Insecticide, Fungicide, and Rodenticide Act (FIFRA). Bedbugs can be difficult to spot, as they hide in crevasses in the mattress, floor joints, and even picture frames. Learn how to combat these pests.